The review and benchmark embargo on GeForce GTX 1080 has ended and we finally have the independent information on card’s performance. There are also more details on its configurations and feature set. The performance improvement, compared to older Maxwell cards is quite clear, as long as there is no CPU or memory limitations. GTX 1080 outperforms GTX 980Ti by 30% on average. Depending on the game, the performance gain can be slightly lower of higher. Having 8 GB VRAM is also an advantage, compared to most older GeForce cards. Compared to AMD Fury X things are more interesting. In games, where Nvidia has advantage with Maxwell, GTX 1080 can beat Fury X by up to 50–60%. On the other hand, in games favouring AMD’s architecture, GTX 1080 manages only 10–15% improvement over AMD’s old flagship. Overclockers will like new GPU Boost 3.0 with more granular overclocking, allowing setting different frequencies for different voltages before hitting temperature and power limits. Automatic overclocking tools are also supported, making process much easier. There were some rumours about Founders Edition GTX 1080 and 1070 being overclocked, but they turned out to be false. Founders Edition cards are just reference models that come at a considerably higher price than cards from Nvidia’s partners. While those will launch first, a little patience seems more worthwhile. Situation is also interesting for people planning to get multiple GTX 1080 cards in SLI. For two-card setup, Nvidia recommends their new high bandwidth bridges using two SLI connectors on each card. While old hard LED bridges and flexible bridges still work, they limit SLI performance. If you are one of those rare people who want three or four cards in SLI configuration, you are out of luck. While it is still supported on GTX 1080 using older bridges, it is locked by default. It can be only unlocked by a hardware-specific key, which you have to request from Nvidia. Unfortunately, there is still little information on GTX 1080 VR performance improvements. While new hardware features should offer dramatic improvements, developers have to implement them in their games. Until that happens, the VR performance gains do not change much from the standard games. Finally, there are some additional information about GTX 1080 media capabilities. While Maxwell supported HEVC (h.265) hardware media encoding, the decoding of HEVC video was done in software. Pascal has hardware capability to encode and decode 4K 60 FPS HEVC videos. Additionally, GTX 1080 fully supports output to HDR displays with wider colour gamut and 12-bit depth per colour channel. Currently, most consumer displays are only using 8-bit/channel input and may display even less dynamic range. Nvidia has also announced an additional option for syncing game output to display refresh and avoiding tearing. Fast sync allows game to generate new frames as fast as possible and only sends the last finished frame to display. When you can render game faster than your monitor’s refresh rate, this approach should eliminate tearing with minimal increase in latency. This approach is how actual triple buffering works in OpenGL games and how windowed and borderless games run on Windows 7 Aero desktop and Win 8, 10. Fast sync should work on any game in true full screen mode. While it is currently announced for the latest Pascal cards, it is likely to be supported on older GPUs with driver updates. Overall, GTX 1080 fits in the standard pattern of consumer GPU generational improvement. Smaller transistors provide a less power hungry GPU with a decent performance increase over larger older chips. 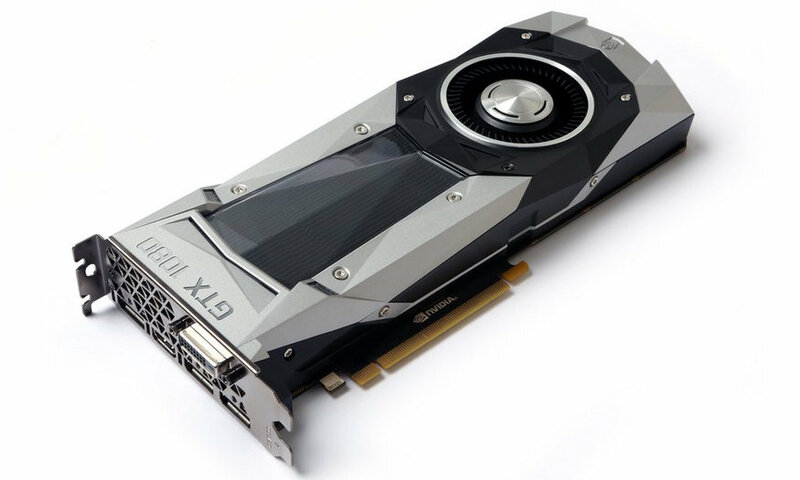 While larger, more powerful GP100 or similar will reach consumers eventually, GTX 1080 is very likely to remain Nvidia’s most powerful GeForce card for the near future. More price conscious buyers should also wait a little to see if less powerful GTX 1070 offers enough performance for its price. You think this means AMD will start pushing AMDopen soon?